Escape to Romance with Melissa Mayhue | Got Fiction? 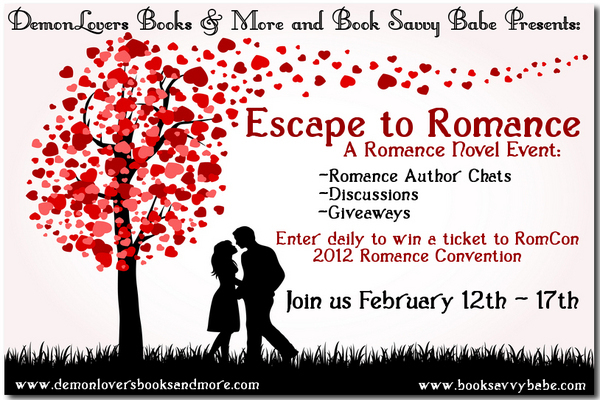 Welcome to Escape to Romance, hosted by myself, DemonLover of Demon Lover’s Books and More and Book Savvy Babe. 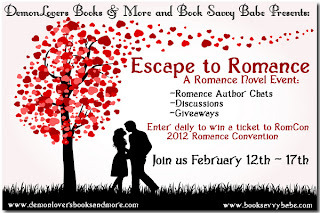 Since it’s a week of love, we are celebrating romance with the Escape to Romance event. We have so much going on this week, from author visits, interviews, and chats, to romance discussions, and lots of awesome giveaways and prizes! The more you participate, the more chances you have to win! Our grand prize of the event is a RomCon Registration Ticket! If you can’t make RomCon, or you are international, don’t worry, you can win a $30 to Amazon or The Book Depository! June will mark the third RomCon conference…and my third time to attend. Last year I enjoyed myself SO much! I met so many people who share my love for reading and for reading Romance novels in particular. What could be better? I’m already feeling that pit-of-the-stomach excitement build for this year! Two events in particular are ones I’m really excited about this year. The first is Deeanne Gist’s Titanic Tea Party. After getting the opportunity to participate in her historical fashion show last year, I was reminded of how much I always loved playing ‘dress-ups’ when I was a little girl. Apparently, I haven’t grown up all that much! When the Titanic Tea Party opportunity presented itself, I was front and center with my “Pick me! Pick me!” I’m even making my own dress! [We’ll see how that turns out, won’t we???] J It sounds like it’s going to be so much fun! The second is the Highlander Event… which looks like it just might be a Scavenger Hunt sending the participants through plenty of wonderful Highlander stories. 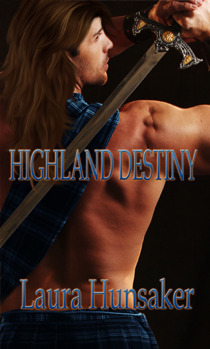 And considering how much I love a story about a strong, hunky Highlander, this should be right up my alley! Of course, the very best part of RomCon every year is the people I get to meet and spend time with. This event has allowed me to meet people from all across the country and bond over our shared love of books. This year I feel like I’m waiting for a reunion of old friends… and I can hardly wait! 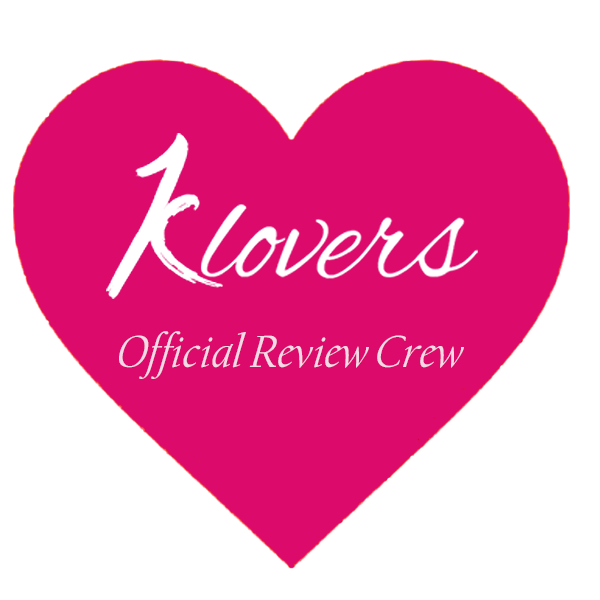 If you love your romance books and you’re looking for one really fun weekend immersing yourself in those books, this is the place for you. I’d love to see you there. Stop me, say ‘hi’ and let’s talk stories… I’m always looking to add to my list of friends I can’t wait to see again NEXT year!! I, myself, can’t wait to see Melissa this year at RomCon2012. For those of you that can’t make the convention, be sure to check out Melissa’s books. Melissa has a reputation for turning out some steamy Highland stories in her Daughter’s of the Glen series. 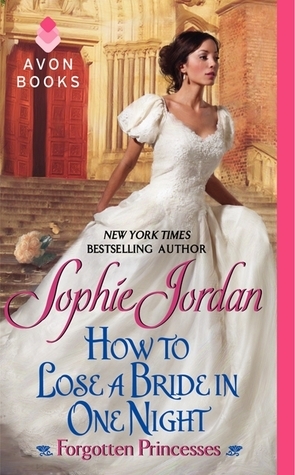 but recently she’s added a spin off series and the first book released last month. MALCOLM MacDOWYLT sees himself a failed warrior, haunted by the death of the woman he married to become laird of Clan MacGahan. Neither his Viking heritage nor his claim to descend from Norse gods can restore his confidence in his ability to protect his people. His sister is held captive, her life in jeopardy and his Magically powerful half brother wants him dead. The last thing he needs is more responsibility, but that’s exactly what he gets when his Faerie mother-in-law arrives seeking justice for her daughter in the form of an enticing woman from seven hundred years in the future. With the lives of those most dear to him hanging in the balance, Malcolm sets out to battle a powerful evil magic, only to learn that the redemption he seeks exists in the arms of the woman he loves. Have any questions for Melissa? So get those questions ready! Sorry, filled out the wrong Rafflecopter form. Only meant to fill out the GC form. Melissa I love your Highlanders. I’m looking forward to read the new series. Hoping to make Rom Con next year. The Titanic Tea Party sounds amazing. I must admit that you are a new author to me but i would love to discover your books. could you tell me how many books the spin off serie will count? These books sound fantastic! Thanks so much for the giveaway opportunity! Melissa, you are a new to me author and I look forward to checking out your backlist! Highlander heros have always been a favorite of mine. Thanks for the giveaway! how did i not know there was a new spin off series?? i LOVE the other one.. where will this new one fit in series wise? would really appreciate the chance to win, thanks! I can always use another great Highlander. Ladies, this is such a fantastic thing. The RomCon parties sound like a blast. My question is this: Out of all the possibilities for heroes, was there something specific that nudged you to choosing Highlanders? 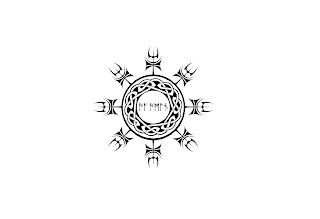 I love your Highlanders and I can’t wait to read Warriors Redemption. 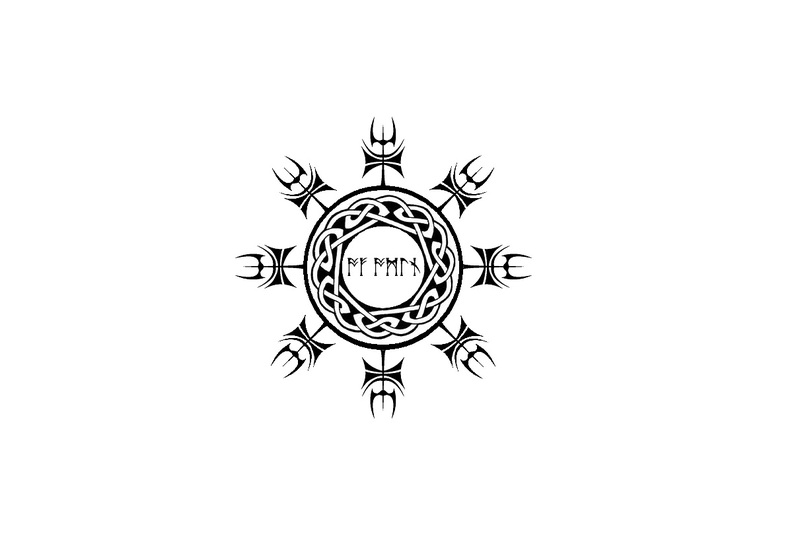 My question is: have you written or do you wish to write any stories that don’t feature Highlanders? Not that I want you to stop writing them, I’m just curious. Wow! So many great questions! Let met get into them and try to come up with answers! Ideas come from everywhere; many of them spring on me while I’m researching some specific item for what I’m writing and just bump into some little fact or story that sets me off. Seleste/Julie – I always loved reading about Highlanders, so that was part of my reason for using them as my heroes. The second part is that I was IN Scotland on vacation when I finally made the decision to write that first book. It just seemed to be… ‘intended’ that I write about Highlanders! Tore – The Daughters of the Glen series was my first. I have a total of nine books published [with one more written, set for release in November of this year]. I’m hanging out for the next hour, so if you have any other questions, feel free to post. If you miss me, post anyway. I promise to check back again later, too! I am giving away another Highlander book on my other site http://www.gotfiction.com from author Laura Hunsaker which is an ebook & that giveaway is International. Hi Melissa, I absolutely loved the last Warrior book. It was great and Im looking forward to the next book. If I win this trip to Roncon I will look forward to meeting you there!! Im so glad I found your books. Keep up the great work. Thanks so much, Sue!! Love hearing that people enjoyed the book! 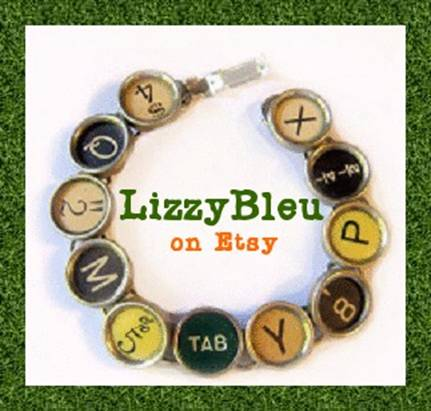 Keeping my fingers crossed for ALL of you on RomCon…SO much fun! Ah, Highland Hussy, thanks so much! And, you’re right, Jennifer. It IS a blast. 🙂 Of all the conferences I’ve attended so far [and there have been a BUNCH! ], RomCon has been the best because it has been the most focused on letting authors and readers just have fun and visit! You’re a new author for me but I wonder how you got interested in Highlanders? Thank you so much Melissa for taking time to join us today and chat with the readers. I always enjoy highlander stories and find they make great heroes for their time. There’s action but always romance. Sounds great. Definitely time to expand my highlander knowledge. My bad, I forgot my email address. Well just in case anyway, I am adding it here as well and on Rafflecopter LOL! Thank you guys again for this. Melissa, what is it you are looking forward to at RomCon this year? I’m looking forward to the Titanic Tea Party and the author panels. Wish I could go to Romcon. Maybe next year. I also loved your Daughter’s of The Glen series.Once again I filled out the wrong Rafflecopter. Sorry.